Definition of “genius”: someone who has exceptionally intellectual or creative power or other natural ability. Doing or creating something truly creative will be the defining feature of success in the 21st century. This requires us to seek out our abilities and the innate resources born to us, raise our performance and fulfil our potential – in other words, to enable our genius. This fascinating book examines the nature of genius in human beings and what it takes to go beyond mediocrity and ordinariness. Written by a leading thinker and consultant in human performance, together with contributions from other experts in the field, the book identifies three specific kinds of genius that are within everyone’s reach: unique individual genius (in a specific discipline, craft or skill set); genius in any discipline, craft or skill set; moments of genius (that occur as spontaneous, unplanned events); and collective genius (the coming together of individuals to deliver something extraordinary). 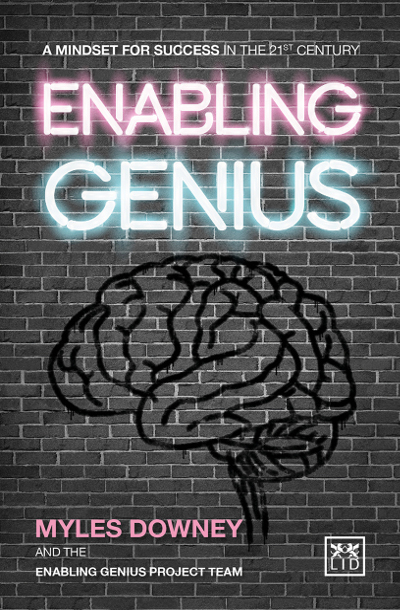 Awakening the genius in all of us – and developing a new mindset for success in our work and life. Everyone is capable of moments of genius – this book unlocks that hidden potential in us. Success in the 21st century will depend on our ability to be truly creative – to enable our genius. Includes fascinating examples and stories of individuals who achieved unexpected moments of genius in their lives. Myles Downey is an expert in human potential. He coaches executives and leadership teams and is the author of the bestselling Effective Modern Coaching. Target presents a unique approach to business and life, taking inspiration from the wisdom of the ancient Japanese martial art of archery - Kyudo. Kyudo has a particular teaching: Right shooting always results in a hit . This means that you shouldn t worry about simply hitting the target; instead, you should calmly focus your energy and willpower on proper mindset and form. In doing so, this right-minded shooting will naturally result in a hit. In the business world, we are all under the pressure of hitting sales targets, improving profit margins, increasing efficiency and maintaining relationships. The philosophy of Kyudo gives new perspectives and solutions to the struggles and opportunities that anyone may encounter in their business and career. Target stands as a relevant guide to our modern times. The Kyudo aphorisms have been passed from Japanese masters directly to the author, and have been put into practice for professional and personal situations.